(40) Mens Vintage 70s Western Leisure Jacket! Gray Blue w/ Embroidered Light Blue Yoke! 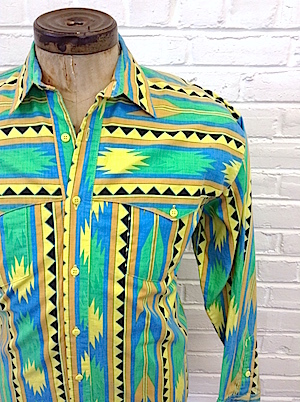 Home > Vintage Jackets > Vintage Jackets: 60s 70s 80s > (40) Mens Vintage 70s Western Leisure Jacket! 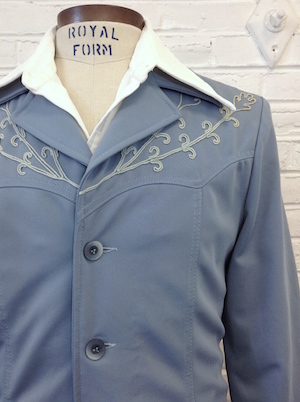 Gray Blue w/ Embroidered Light Blue Yoke! Mens vintage 1970s disco western style leisure jacket! 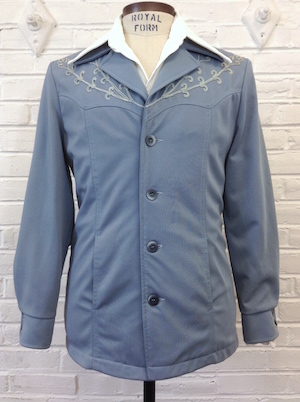 A funky jacket for a fancy urban cowboy in a gray blue with swirly, light blue embroidery on the front and back of the yoke! Super wide and pointy 70s collar. Closes in the front with four marbled blue buttons with two matching buttons on each cuff. Two interior pockets in the front of the jacket. Fully lined in a light blue acetate. Tagged by Lee. 100% Polyester. Made in the U.S.A. Condition: Very Good. Has some light gray staining on the left cuff and a small peach colored stain just above the cuff. Does not detract from the awesomeness of this jacket!